muffin | It's all about the cake! 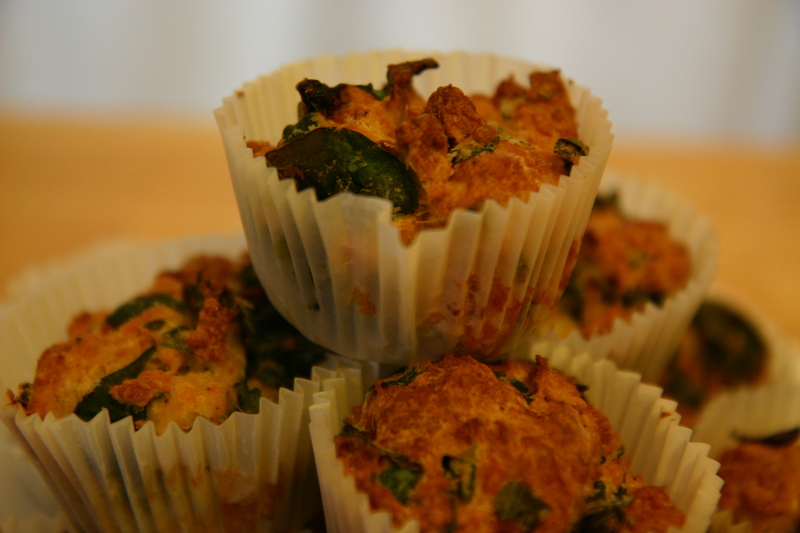 Anyway, these are very cheesy spinach and cheese muffins. They are nicest warm and I’ve been finding them good for a pre or post run snack – I feel less bad about eating them as I do a sweet cake, although I do sometimes have both! And very handy to pop in your lunch box. Oh dear, yes, I do take a lunch box to work with me! PS. This seems quite an uncakey start, having a savoury item as the second post. I will ensure that this does not happen again. This is a cake blog, not a spinach and cheese muffin blog. Apologies. Preheat oven to 170C (325F). Melt the butter in a saucepan and gently fry the onion until cooked. Set aside. Put the flour, baking powder, cayenne and cheese in a large bowl. I used chilli powder instead of cayenne – not sure if it’s an appropriate substitute but seemed to work fine, although wasn’t all that spicy. In a separate bowl mix the milk and egg together, then slowly pour the into the flour mixture and beat together. Stir in the onions and spinach with a wooden spoon until evenly mixed. Spoon the batter into muffin cases until 2/3 full and bake in oven for 30-35mins, or until deep golden and a skewer comes out cleaned. Let the muffins cool slightly in the pans before turning out onto a wire rack to cool.